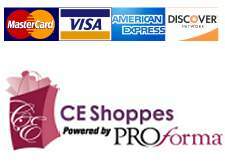 On-line: Once you decide on a product you can select the "Buy" button and you will be taken to our CEShoppes on-line shopping cart. Please make sure to add any additional notes about your order at the check out screen. Include event date, color selections, gift cards etc. Via Email: Send an email to customerservice@CEShoppes.com Please include the following in your email: Bill to address, Ship to address, Your Name and Phone number. Also include the item#, description of the product, and quantity. Include event date, color selections, gift cards etc. 1. Once you place your order we will provide you with an order acknowledgment via email as a .pdf, that will need to be signed and faxed back to our toll free fax number that will be provided on your acknowledgment. 2. Once signed you will need to email your .eps vectored art to the address provided in the order acknowledgment, using the job number provided in the same order acknowledgment in your subject line. 3. Once your order has been placed, and we have received your useable .eps vectored art converted to curves or outlines, we will turn your order in to our factory. It will take approximately 3-5 business days for an art proof to be sent to you via email pdf. You can make changes to your art or approve it as shown. 4. Once you have approved the proof, we will charge your credit card (or if paying by check, your order will be held on hold until we receive the payment.) Once payment has been made, your order will go in to production. 5. The day after your order ships we will email you tracking and the shippers web address so you can track your package and see who signs for it. 6. Approximately 7-10 business days AFTER your order ships, we will charge your credit card (or bill you DUE UPON RECEIPT, if paying by check) for shipping and any overruns. - Your final ZERO Balance invoice will be sent via pdf, from our accounting department.